“Haruka” is an oyster brand that is safe and rich in flavor. To meet the demand of consumers such as making oysters almost equal size and weight, we have renewed our production method. 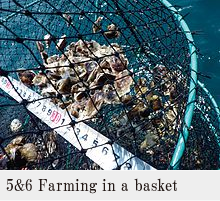 The single seed farming realizes production of beautiful shells and fat oyster meat. 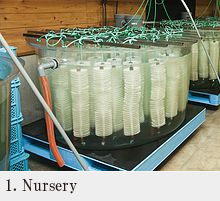 We feed phytoplankton to oyster larvae in a ton of water tank. The larvae develop a part like sucker after a month, and we place a resin disc called “trail” as a culch inside the tank. Then the larvae get attached with the disc. 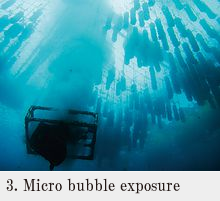 Minus-charged micro bubbles get attached with unwanted bacteria and substance on the oysters and the bubbles takes them away from the oysters. 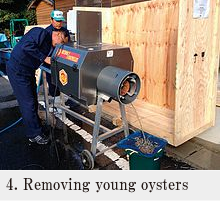 Young oysters are removed from the trail by vibration. 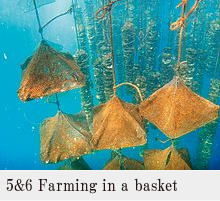 To make oysters to prey on more phytoplankton, different baskets are used as oysters grow. Three oysters are attached to a rope using Kaidelight®, a cement-based adhesive invented specifically for oyster farming. The usual hanging method used for oyster farming is that first making a small hole on a shell and hanging the shell to a rope using guts. It is difficult to make each oyster be evenly fed, which sometimes ends up that only some oysters grow big while others are small. Especially for open sea cultivation where less phytoplankton exist, it is concerned that some oysters do not grow big enough. So we adopted attachment method using Kaidelight®. Instead of hanging oysters to the rope, we attach them using the special adhesive. 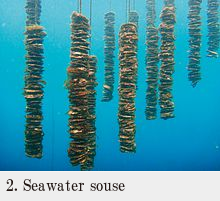 Evenly attached oysters grow better, and compared with hanging method, the attachment method improved the growth of oysters 10% to 20%. 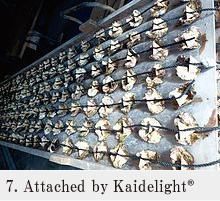 Kaidelight® was invented specifically for oyster farming, so it does not have any bad effect on oysters. 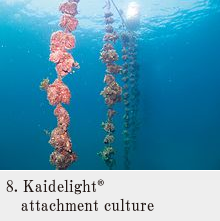 After oysters get attached by Kaidelight®, they spend three years in open ocean to grow up slowly.